Following half a decade of steady declines in vehicle dependability, the J.D. Power 2019 U.S. Vehicle Dependability StudySM (VDS) shows overall industry improvement for the second year in a row. In the 2018 study, overall vehicle dependability improved 9%. This year, the industry improves by 4%, to an average of 136 problems per 100 vehicles (PP100). Now in its 30th year, the annual VDS measures problems experienced by original owners of 3-year-old vehicles during the past 12 months. The study covers 177 specific problems grouped into eight categories. This year, the study measured the dependability of 2016 model-year vehicles. For the eighth year in a row, Lexus ranks highest in vehicle dependability among all brands, with a score of 106 PP100. That score keeps Lexus in the lead, but it does represent an increase in reported problems compared to 2018, when the company scored 99 PP100. Porsche and Toyota rank second in a tie, each with a score of 108 PP100. That represents a slip in dependability for Porsche (from 100 PP100 in 2018), and a big improvement for Toyota (from 127 PP100 in 2018). Chevrolet ranks fourth among all brands, improving to 115 PP100 (from 124 PP100 in 2018), followed by Buick at 118 PP100 (from 116 PP100 in 2018). Among brands that made significant gains in dependability, Chrysler improves the most, lowering its problem score by 65 PP100. However, its overall score of 146 PP100 remains below the industry average of 136 PP100. BMW Group’s Mini brand (-34 PP100) is the second most improved, followed by Subaru (-31 PP100). General Motors receives the most dependability awards this year at the segment level, for the Buick LaCrosse, Buick Verano, Chevrolet Equinox, Chevrolet Silverado HD, and Chevrolet Sonic. Four awards go to Toyota Motor Corporation models for the Lexus ES, Lexus GX, Toyota Camry, and Toyota Tundra. The Porsche 911 receives the first annual Most Dependable Model award thanks to its industry-topping performance in the 2019 VDS. Other models earning awards include the Audi Q3, BMW 5 Series, BMW X3, Chrysler Town & Country, Dodge Challenger, Ford Expedition, Hyundai Santa Fe, Kia Soul, Mini Cooper, Nissan Frontier, and Volkswagen Tiguan. J.D. 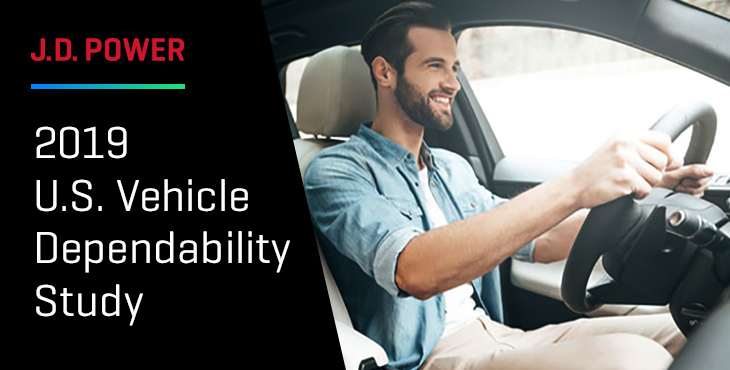 Power analysis demonstrates that vehicle dependability impacts vehicle residual values. If you own a dependable model, you can expect to get more money for it when you sell it. If you’re buying a dependable model, you may need to pay a premium compared to other choices in the segment. Many problems reported about modern vehicles are related to technology. Choosing a model with fewer high-tech features could lead to greater satisfaction with the vehicle’s dependability. Historically, German vehicles were considered risky in terms of dependability, but recent trends indicate this is no longer true. From the Porsche 911’s study-topping performance to Volkswagen’s industry-leading People First warranty program, evidence suggests that German vehicles are more dependable than ever. The 2019 Vehicle Dependability Study is based on responses from 32,952 original owners of 2016 model-year vehicles after three years of ownership. The study was fielded in October-December 2018. Families flock to midsize SUVs for their seating capacity, cargo capability, and available all-wheel-drive systems. This guide provides essential information about the 10 most popular, non-luxury midsize SUVs and crossovers in America. According to J.D. Power, these are the crossovers and SUVs that are expected to provide the best reliability over time. If you're planning an upgrade to a premium car, this buyer's guide provides details about the 10 most popular* luxury cars in America, including pricing; quality, reliability, and appeal ratings; fuel economy; safety ratings; and cargo volume.